Here is my final quote for the “three quotes in three days” challenge. I think we can all get behind this one. Thanks, Bill and Ted, and Party On Dudes! It doesn’t get any better than excellent! 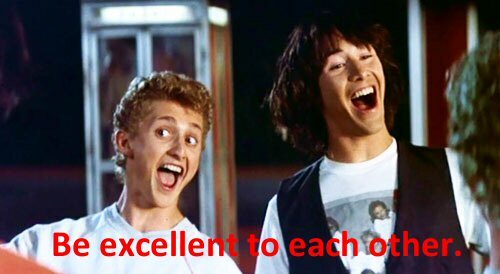 Bill and Ted were just so…er…excellent! Great quote and great picture. In the film they changed the world. Wouldn’t that be nice? A good note on which to exit! Have you by any chance seen/ heard the Epic Rap Battle of History with Lewis and Clark vs Bill and Ted? I haven’t, I’ll have to see if I can find a clip.